A Hollywood source has told Infowars that makers of the upcoming movie Courier X, a drama about the 1996 crash of TWA Flight 800, were visited on set by two men who threatened the producer that it would be in his best interests to stop filming. 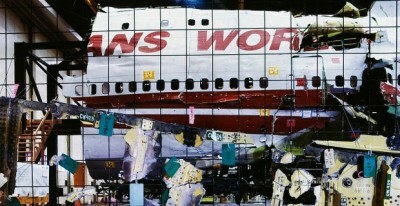 TWA 800 exploded and crashed into the Atlantic Ocean on July 17, 1996 just 12 minutes after taking off from JFK International Airport. Although a National Transportation Safety Board (NTSB) investigation concluded that the plane crashed as a result of a fuel tank explosion caused by a short circuit, conspiracy theories about the incident have raged for years, with some blaming a terrorist attack or a U.S. Navy missile launch gone awry for the downing of the airliner. Infowars was contacted by a source who has been involved with numerous Hollywood projects and although he wishes to remain anonymous, we subsequently confirmed that he worked as a key grip throughout the production of the movie. “We met in a common area each morning and then were driven to secret filming locations. We didn’t even know who the actors were, until they showed up on set. Normally we have a full cast list and a full script to prepare. Very unusual production,” he adds. The source also said that he and other crew members were “scared” and “nervous” about their involvement with the movie. Last year, a group called the TWA Project filed a petition with the NTSB demanding the probe into the crash be re-opened, asserting that a “high-velocity, right-moving explosion” consistent with a missile was responsible for bringing down the airliner. The NTSB refused to resume the investigation. Last month, the 1st Circuit Court ruled that the CIA did not have to release radar analysis pertaining to the crash or names of eyewitnesses who described a streak of light rising up to the plane just before it exploded. The case was brought by physicist Thomas Stalcup.